Dr. Moran is originally from the New York City-area and graduated from John Jay College of Criminal Justice with a Bachelor’s Degree and Master’s Degree in Forensic Psychology. She then went on to practice for one year while interning in child psychology. She then attended a post-baccalaureate premedical program at Columbia University, where she received her premedical certificate. She then went on to earn her medical degree at the David Geffen School of Medicine at the University of Los Angeles (UCLA). She then did her Adult Psychiatry residency training at Harbor-UCLA prior to transferring to the University of Wisconsin Hospitals and Clinics, where she completed her Adult Psychiatry residency and Child & Adolescent Psychiatry fellowship. Dr. Moran has previously provided psychiatric care in a variety of settings including inpatient, outpatient, and psychiatric emergency room treatment. 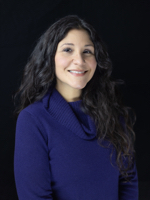 She has also provided care as a Master’s level psychologist in doing individual therapy with children, adolescents and adults, as well as working as a behavior evaluator for children and adults with Autism. Dr. Moran provides psychiatric evaluation and treatment for individuals of all ages. Her skills include diagnosis, medication management, limited psychotherapy, and coordination of care with other treatment team members including therapists and primary care providers. Areas of special interest include Anxiety, Autism Spectrum Disorder, Depression, OCD, Attention-Deficit/Hyperactivity Disorder (ADHD), and Post-traumatic Stress Disorder and other trauma and attachment related disorders. Dr. Moran also has a special interest in cross-cultural psychiatry, and is proficient in Spanish. Dr. Moran conducts psychiatric evaluations for diagnosis and treatment planning. After her initial evaluation, her primary focus is on safe and effective medication management. Brief therapy techniques employed by Dr. Moran include cognitive-behavioral, interpersonal, supportive, solution-focused, psycho-educational approaches and trauma-informed child-parent psychotherapy. Dr. Moran is Board Certified in Adult Psychiatry, and Board Certified in Child and Adolescent Psychiatry by the American Board of Psychiatry and Neurology. She is a member of the American Academy of Child & Adolescent Psychiatry, the American Psychiatric Association, and an alumnus of the American Psychiatric Association’s Minority Fellowship Program.